"Win £1000 Twice Every Week on EuroMillions with this Free Lotto Game"
Free Lotto? Have you ever heard of such a thing? It is not very often these days that we can get something completely FREE. When we see something being offered at no cost at all, we generally think that is some kind of “catch” involved – that really, we will have to pay something and that the offer doesn’t really mean free at all. Well, we have found a lottery that you can take part in which is completely FREE of CHARGE! No cost at all – absolutely ZERO! What if you could enter the EuroMillions without having to pay a penny? Wouldn’t that be great? Well, now you can – there IS a way! In fact, TWICE EVERY WEEK you can enter the EuroMillions completely FREE of charge courtesy of YouPlayWePlay and their Grab A Grand program. Each Tuesday and Friday the EuroMillions is drawn and with YouPlayWePlay you can enter their free Grab a Grand competition to win £1000. All you need to do is pick 5 numbers from 1 to 50 and enter them into the Grab a Grand website provided to enter the free lotto. If your chosen 5 numbers match all of the 5 main numbers drawn in the EuroMillions lottery on either the Tuesday or the Friday…you will win £1000 completely FREE! Simply enter your name in the box provided on the GrabAGrand page – then enter you 5 chosen lottery numbers from 1 to 50. Once you have done this – just enter your email address into the next box and hit "Enter" – making sure you have ticked the box marked "conditions of entry". That's all there is to it! 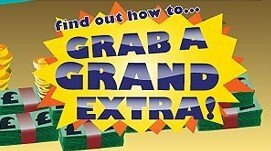 You will now be automatically entered into the next Grab a Grand Free Lottery draw and your numbers compared with the numbers drawn in the next EuroMillions game. You will receive an email from YouPlayWePlay detailing the numbers you have chosen along with a unique reference number plus an email address to contact YouPlayWePlay should you strike lucky an match all 5 of the main EuroMillions numbers. Play to Win £1000 on the EuroMillions ...Completely FREE! You are not limited to entering this free lotto just once – not even just for one week – you can do this week after week without limit – that’s 2 FREE chances to win £1000 on the EuroMillions every single week. As we’ve said – YouPlayWePlay make absolutely no charge for these EuroMillions entries and if you correctly match your 5 numbers, they will pay you your £1000 winnings directly and promptly. To illustrate the value of these free lottery entries – they are equivalent to a 5 BALL WIN on the main UK Lotto game. On average, the amount won for matching 5 balls correctly on the UK Lotto is £1000 – and you are now able to try and match this twice every week free with the Grab a Grand EuroMillions entries. You can also tell your friends, family and anyone else about this great chance to try their luck with entries into EuroMillions free of charge. If any of them manage to match the 5 numbers correctly with the 5 main EuroMillions numbers drawn, they will also win £1000 completely FREE! They will also be able to enter the Grab a Grand draw twice every week on Tuesdays and Fridays in conjunction with the EuroMillions lottery. Now that really is what we call a FREE LOTTO! The Grab a Grand free to enter competition is a great way to win £1000 in the EuroMillions lottery without having to pay a penny. So – just go to the GrabAGrand website or click on one of the banners and then enter your 5 chosen lottery numbers. Do this twice each week to take part in both the Tuesday and Friday EuroMillions draw for £1,000 without paying a penny. Good luck with your entries and if you win, please do tell us about it – it’s always great to hear about lottery winning stories.